Every recipe I have posted here I have personally tried. Some are excellent and I keep referring to them. Others are a work in progress and need a certain something. I'd say this is a work in progress. Now, why would I be posting this? These cookies are about as guilt free as you possibly can get. There is zero added fat, sugar, or chemicals. They are low in calories at 50 calories to the ounce. They are high in fiber - every ingredient is high fiber. They would make an excellent meal replacement. 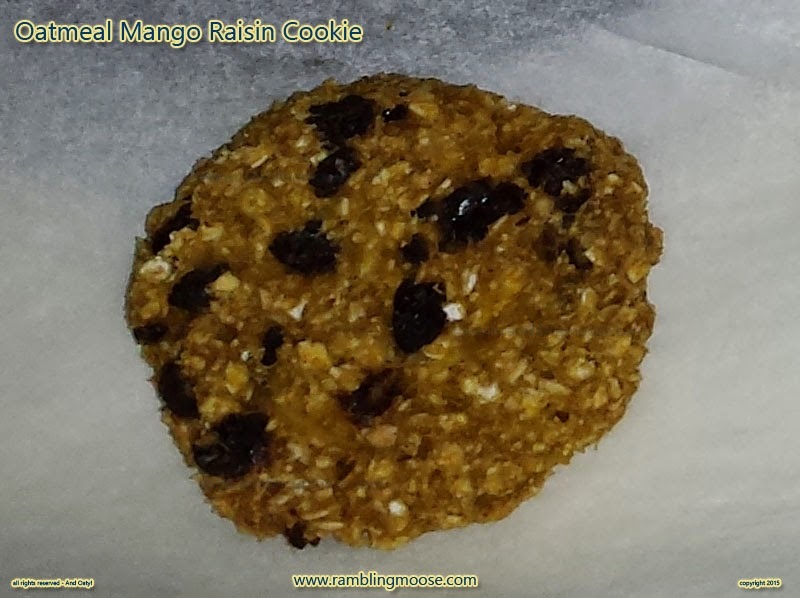 They taste of Oats and Mangoes, Cinnamon and Raisins. They are easy to make, and actually kind of fun to make too. They have no wheat, rye, or barley flour so it is Gluten Free. They can be made with Bananas if you don't like Mangoes. So why the weak praise? If you were looking in my window at this moment, you would see me chewing on one of these right now. But, they're just not "sweet". Oh sure, they're sweet, but cookies traditionally are a sugary treat. These are a very healthy food, but since there is no added sugar, you just don't get that "dessert-y" sugary kick out of them. If I were to make these for a proper "snack" I would increase the amount of oats and add some honey to them. The other drawback is that the texture for the length of time I baked them was wrong. I'd bake them longer than the 8 minutes you see listed because they were a bit "spongy". That's a trade off, so bake them until they're well done and you should get something more chewy as the natural sugar in the Mango will caramelize. Longer still and you'll get crunchy. Anyway... These puppies will fill you up and probably should be called Granola instead. But I digress. The Recipe - as listed made a little more than 8 cookies. 4.5 ounces of Mangoes in chunks - Banana can be substituted as well as firm melons like Canteloupe or Honeydew. Chunk your Mango into a mixing bowl. Add Quick Oats, Raisins, and Cinnamon to the Mango. Mix with your hands the batter until evenly mixed. The batter will be the consistency of a sticky dough or modeling clay. Measure out your cookies in one ounce servings. Roll the cookies into a ball and then flatten them out in the palm of your hand. Thinner is best! Place them on the cookie sheet, and since they don't rise, they may be placed closely together. Bake at 350F for 8 minutes for soft cookies, longer for other textures.